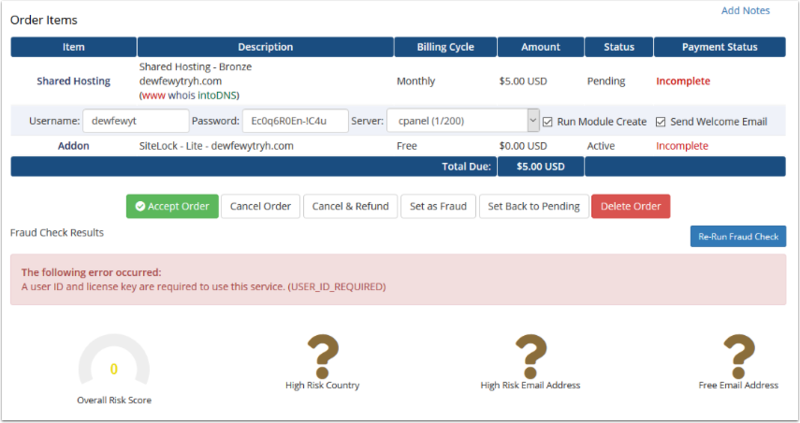 After applying the the WHMCS 7.6 update, you may encounter a situation whereby Maxmind fraud checks are not performed on new orders. All orders automatically pass the fraud checks. MaxMind Fraud Check - Error Occurred: USER_ID_REQUIRED - A user ID and license key are required to use this service. WHMCS Version 7.6 uses the newest version of the MaxMind minFraud API. This requires an additional credential set to function. In version 7.5 and earlier, only the MaxMind License Key was required, now the MaxMind User ID is also required. Fraud checks can now be performed on new orders.